When it comes to precision part production, you have many choices. However, not all options are created equal. Closed mold processes such as Light Resin Transfer Molding (LRTM), Reusable Bag Molding (RSBM) and Vacuum Infusion Process (VIP) are all popular ways to create precision parts. These processes often offer a lower cost and can be used in a variety of applications. Let’s explore these, so you can determine if it’s right for your business and how Magnum Venus Products (MVP) can help you today. In the process of closed molding, the raw materials of fibers and resin cure inside a two-sided mold or within a vacuum bag that is devoid of air. Closed molding is an automated approach that requires special equipment that you will most likely find in large plants that are creating a high volume of parts. To determine what type of closed molding is best for your production, you’ll need to consider each process. The use of this process improves the mechanical properties of laminate, which consists of two or more layers of fiber reinforcement bonded with a resin. The vacuum forces out trapped air as well as excess resin, resulting in a compacted product. The high fiber concentration allows for better adhesion between layers of sandwich construction. This process is best for manufacturing large structures. It produces strong, lightweight laminates. It also produces less emissions, when compared with open molding. VIP uses the same low-cost tooling as open molding, requiring minimal equipment. This closed molding method uses reinforcement material, and the mold is clamped. Injection portals pump resin into the mold under pressure. This process is best for parts that are highly complex. It finishes the mold smooth on all exposed surfaces. This process has the ability to be automated. Because the material is laying up reinforcement, the material dries inside the mold. You can use a variety of different materials and orientations, including 3-D reinforcements. Compression molding uses composite materials by sandwiching it between two matching molds under intense pressure and heat (from 250° to 400° F) until the part cures. Compression molding works well for curing large quantities of complex fiberglass reinforced polymer parts. It’s very fast and has a high rate of uniformity. You can automate this process, which reduces labor costs. For creating rods or bars, pultrusion is the process used most frequently. 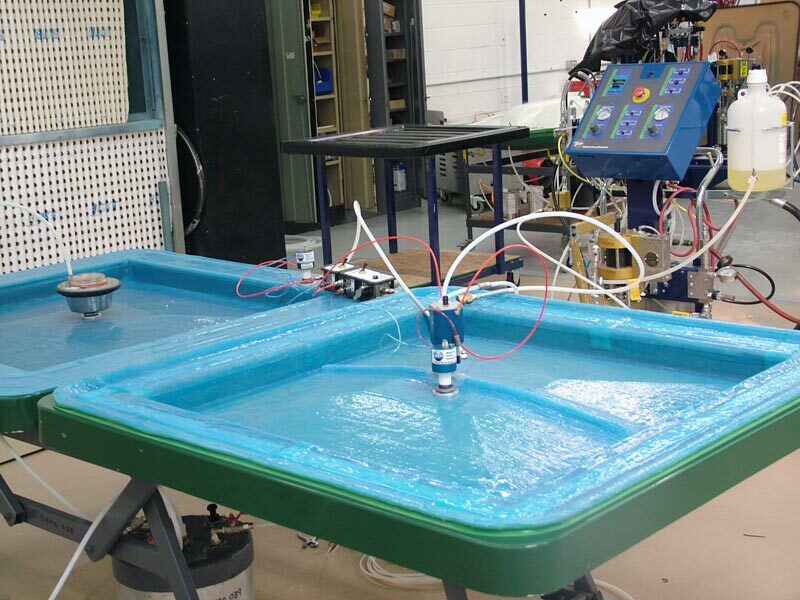 Continuous strands of reinforcement pull through a resin bath to saturate them. Then, the process pulls the heated steel molds to sculpt the composites. It’s a continuous process that can be automated. The finished product is strong and requires little labor interaction. RRIM is a process for external and internal automotive parts. Two or more resins heat separately then combine with milled glass fibers. Molds receive the mixture via injection under high pressure. The resin cures quickly. RRIM composites have many advantages, including a fast cycle time, low labor, low mold-clamping pressure and low scrap rate. The RRIM process requires special resins and reinforcements. In centrifugal casting, a deposit of reinforcements and resin goes inside the surface of a rotating mold. The centrifugal force holds them in place as the material cures. This process produces hollow parts, such as pipes, including extremely large diameter ones for oil and chemical applications. Continuous lamination is the process to create flat or corrugated sheets and panels, which you’ll find in truck and RV sidewalls, road signs, building panels, and other materials. Fibers and resin combine, squeezed between two plastic carrier films, and then go through a conveyor process. Forming rollers shape the sheets, and the resin cures to form the composite panel. What Are the Benefits of Closed Molding Compared to Open Molding? Closed molding processes allow manufacturers to make parts faster, more consistently and with numerous advantages according to Composites World. Closed molding produces less waste and finished parts have better surface cosmetics, reducing the need for post work. Less emissions are another advantage, helping manufacturers meet Federal, State, and Local standards. These processes are also less dependent on labor. Of the several open mold processes, one is spray-up or chopping and the other is hand lay-up. This process turns out parts for boats, RV components, truck cabs, spas, and other fiberglass composite products. Open molding is the most flexible of all composite fabrication processes due to the fact that design and size are customizable. Open molding processes can be found in plants that turn out a wide range of products that cannot be automated. If you are seeking a more efficient way to mold, it’s time to consider closed molding. Closed molding can help you achieve an overall more efficient process. Learn more today about closed molding equipment from MVP.